Brave New World: McReading to a Healthier Future? Once again we have to ask why the trade is continuing to tie the promotion of reading with Fast Food and openly supporting McDonalds advertising and promotion to children. Earlier this year McDonalds announced a two-year children’s books campaign in the UK, committing to "hand out more than 15 million books by the end of 2014” through a £1 book offer on its Happy Meal boxes. This has the backing of the UK’s National Literacy Trust, enabling customers to buy books for £1, with a token redeemable on selected books at W H Smith. Since we first reported th eUK campaign 'Does Publishing Have Ketchup On Its Hands? ', we have reported on a similar campaign in Portugal, 'More Ketchup with Books on the Side' and now one has been announced in the US. American Heart Association state that about one in three American kids and teens is overweight or obese, nearly triple the rate in 1963. They claim that childhood obesity is now the No. 1 health concern among parents in the United States, topping drug abuse and smoking. FRAC (the US Food research and action centre) claim that about a quarter of 2-5 year olds and one-third of school-age children (including adolescents) are overweight or obese in the U.S. (Ogden et al., 2012). 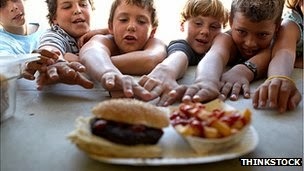 The US Center for Disease Control and Prevention claim that Childhood obesity has more than doubled in children and tripled in adolescents in the past 30 years. The percentage of children aged 6–11 years in the United States who were obese increased from 7% in 1980 to nearly 18% in 2010. Also, the percentage of adolescents aged 12–19 years who were obese increased from 5% to 18% over the same period. November is National Literacy Month in the US, and McDonald’s stores right across the US will give away 20 million books, which will feature McDonald’s characters. They are partnering with RIF (Reading is Fundamental), the largest children’s literacy non-profit in the U.S., which will be giving away 100,000 copies of the books to children who do not have easy access to books. Some would ask whether some organisations have potentially got ‘ketchup on their hands’, in the blind pursuit of reading, at what would appear to be the cost of the health of their readers?